Hundreds of people gathered around the OnBoard Research booth this weekend at the DCI Eastern Classic in Allentown, Pa., to see who had what it takes to be the "World's Most Accurate Drummer" as presented by Beatnik Rhythmic Analyzers. 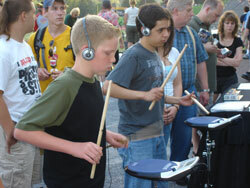 Nearly 100 people of all ages rose to the occasion and competed in this contest, looking to prove their skills to a Beatnik Rhythmic Analyzer electronic drum pad that measured note accuracy to the 512th note. After competitors warmed up on the demo pads available at the booth, they were able to test their skills on the official Beatnik Rhythmic Analyzer of the contest, where they played an unchanging two-bar rhythm for two minutes. Once they finished playing, a score was calculated and awarded to each competitor based on the average of their note accuracy. A perfect score for the competition was 800, and while most people scored around 450, a few people were able to score in the high 600s. 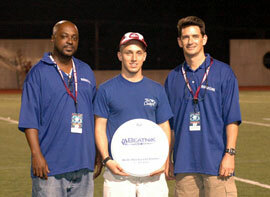 Saturday's competition had two winners, George Clements and Ed McColly, and Sunday's winner was Keith Peskosky. The winners all received drum heads from Beatnik Rhythmic Analyzers, naming them the World's Most Accurate Drummers from Allentown, Pa. "It was a great feeling to win tonight's competition," said George Clements, a bass drummer alum of the Cadets and winner of Saturday night's contest. "It was really cool to be able to play in front of all those people at the booth this afternoon, and then to be named World's Most Accurate Drummer tonight was just awesome." 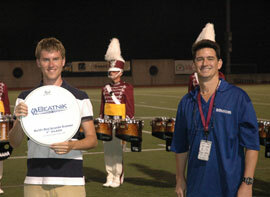 The World's Most Accurate Drummer contest presented by Beatnik Rhythmic Analyzers will be held again at the major DCI events in Atlanta, San Antonio and Indianapolis, and in Pasadena, Calif. for the Drum Corps International World Championships. Learn more about the World's Most Accurate Drummer contest. Practice the lick you'll need to play for the World's Most Accurate Drummer contest.